Give Aloha, Foodland’s Annual Community Matching Gifts Program was created in 1999 to honor Foodland’s founder, Maurice J. “Sully” Sullivan and continue his legacy of giving back to the community. Each year during the month of September, customers are encouraged to make a donation at Foodland to their favorite participating Hawaii non-profit organization. Each year, Foodland contributes more than $250,000 to match customer donations for all organizations combined. Since the program began in 1999, a total of more than $29.1 million has been raised for Hawaii’s charities. During September, Maika’i members are invited to make donations up to $249 to their favorite participating Hawaii non-profit organization at checkout. Simply tell the clerk how much you want to donate and that you would like it to go to HKM. 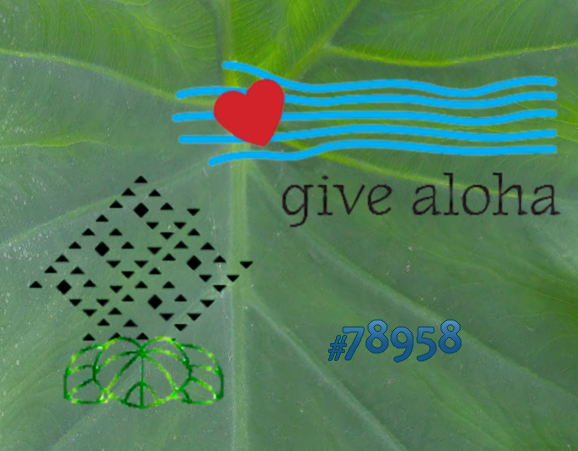 Hālau Kū Māna’s code is 78958. Donations to each organization are tracked, and Foodland’s matching gift is divided proportionately among all participating organizations based on customer donations to the organizations. Foodland’s matching gift, depending on circumstances can be (and often is) as much as a dollar-for-dollar match, meaning that you can double your donation. Please, if you were going to give a monetary gift to the school this year, do it in September, and do it through Give Aloha. Your donation is recorded on your receipt (for tax purposes). Mahalo for supporting HKM. Organizations receive customer donations to their organization and Foodland’s matching gift by Oct. 31.